Historical Marker #2322 in Bowling Green commemoratesLillian H. South was born in Warren County, Kentucky, in 1879. The daughter of a doctor, she was educated in public schools and graduated from Potter College (now Western Kentucky University) at age twenty. She then moved to New Jersey, pursued training to become a registered nurse, and graduated at the top of her class in two years. Afterwards, she enrolled in the Women’s Medical College of Pennsylvania in Philadelphia and graduated in 1904. Dr. South returned to Bowling Green and opened a medical practice specializing in the treatment of women and children. After being in private practice for six years, she was appointed as the Kentucky State Bacteriologist in 1911. 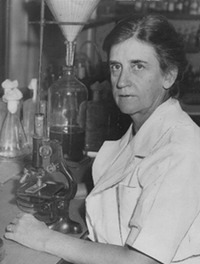 She was the first woman in the nation to be hired as a state bacteriologist, who acts as the official medical official for a state bacteriology department. One of South’s first tasks was to survey the state for the presence of hookworms, which were prevalent throughout Kentucky. In 1912, the Rockefeller Sanitary Commission funded the expansion of the bacteriology lab and provided funds for construction, personnel, and equipment. In return, they relied on Dr. South to pursue the eradication of hookworm, a devastating disease that was due to improper sanitary conditions. South developed a new test for detecting the presence of hookworm eggs and became one of the foremost authorities on hookworm disease. In 1913, she was elected the first female vice president of the American Medical Association. That same year, because of her work, the Kentucky General Assembly enacted a bill to prohibit the use of public drinking cups. This was an important step in the prevention of the spread of communicable diseases. Dr. South created the State Board of Health’s school to train female laboratory technicians in 1922, the first of its kind in the United States. The State Board of Health moved to Bowling Green in 1919. Eighteen years later, when the Ohio River flooded, the Board of Health was inundated by work. Dr. South immediately jumped into action. In order to prevent an epidemic caused by filthy water in Louisville, she worked out of the unheated Brown Hotel and distributed thousands of doses of vaccine to avert a typhoid epidemic. When the State Board of Health moved to Frankfort, Dr. South retired. She was seventy years old and continued to travel the world lecturing and attending professional conferences. She died in 1966 and is buried in Williamsburg, Kentucky. ,” ExploreKYHistory, accessed April 19, 2019, https://explorekyhistory.ky.gov/items/show/396.